Mix the flour and sugar for the pastry, then rub in the butter to form crumbs. Mix the egg yolks with 2 tbsp cold water then mix into the flour to form a dough. Knead for 1 minute until smooth. Wrap in clingfilm and chill for 20 minutes. Meanwhile, preheat the oven to 200°C/gas mark 6. Heat a dry frying pan on a medium heat. Add the almonds and toast for 2-3 minutes until just brown. Cool, then whiz in a food processor until finely ground. For the frangipane, beat the ground almonds, butter, sugar and eggs until well combined. Divide the pastry dough into 12 then roll out each piece thinly. Line 12 x 6cm tartlet tins and place on a thick baking sheet. Trim the pastry, prick the bases, then chill for 10 minutes. Line each case with greaseproof paper and baking beans and bake for 10 minutes. Remove the paper and beans and return the pastry to the oven for 3 minutes. Reduce the oven to 170°C/gas mark 3. Stone the apricots and slice into thin wedges. Spread 3-4 tbsp frangipane in each pastry case. Arrange the apricots on top. 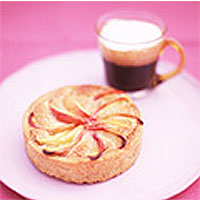 Bake the tarts for 20 minutes until the frangipane is set and the fruit starting to caramelise. For the glaze, heat the jam with 2 tbsp water, then sieve. Allow the tartlets to cool for 1 minute then brush with glaze. Cool, and serve.